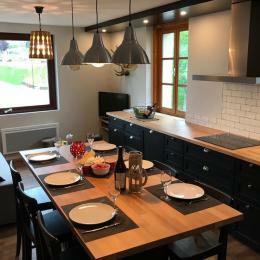 Apartment with 3 rooms, in a large house inhabited by the owner, near the slopes of the Monts-Jura resort in Lélex. Cross-country ski trails at the foot of the house. Living room with kitchenette (1 sofa), television, microwave, dishwasher, 1 bedroom (4 pull-out beds convertible into 2 double beds), 1 bedroom with 1 double bed, bathroom, separate WC. Collective drying cabinet for clothes and ski boots and 1 anti-theft ski locker. Balcony with mountain view (garden furniture). Northwest exposure. 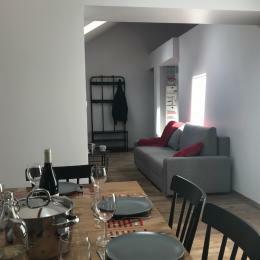 Possibility to rent the 2 apartments for 10 people. 900 m from the village of Lélex. On site, all food shops, winter equipment rental - summer, gift shops and ready-to-wear, hairdresser, tobacco-press, garage - gas station. Restaurants. Services: pharmacy, medical office, post office, bank distributor, tourist office, ski school.